The Luxury Collection is a specialized marketing program with one goal in mind- to deliver our unrivaled customer service and superior knowledge to the luxury market to the most high-end consumers. What set a Luxury Collection Specialist apart? Our Luxury Collection Specialists are an elite group of sales professionals specially-trained to meet the most discerning tastes. They understand the strong emotions and unique requirements involved with the purchase and sale of luxury properties. Only the most select of properties are accepted for representation through The Luxury Collection. The home qualifications, in addition to price, include such indicators as quality of craftsmanship, landscaping setting and maintenance and showpiece appearance. A name you know. It’s essential in today’s real estate market to work with a company you know and trust, with sales professionals you can rely on. 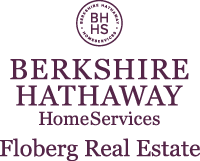 Berkshire Hathaway HomeServices Floberg Real Estate has been helping people reach their goals since 1959.